Chiropractor Durban helps you find the nearest DC. 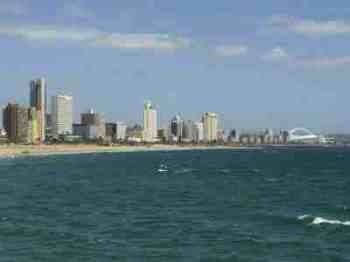 Chiropractor Durban will help you locate your nearest DC. Whilst our profession goes back into the mists of time, the modern profession, and it's name, was coined some one hundred and twenty years ago in 1895 by David D Palmer; the same vintage as X ray, coincidentally; that was discovered by Wilhelm Roentgen. Manipulation was used the ancients; both Hippocrates and Galen avidly used adjustments of the spine. In the Middle Ages they were known as Bone Setters; one of them, a man by the name of Tiezen emigrated to the United States. In France they were known as rebouteax, in Germany knochen einrichter and the algebrista. It is the second biggest healing profession in the United States and Europe, after mainline medicine. There are training institutes in ever continenet except Antarctica, obviously; some 100,000 professionals around the world. There are about fifty in Tegwini,most of whom graduated from DUT; there are some 600 doctors in South Africa. We are known as primary contact professionals, meaning that you can be examined and treated without a referral from your medical doctor. Most medical aids for care. There are two training institutes in South Africa, one in Durban and the other in Johannesburg. 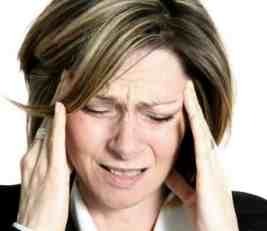 Head neck pain is the second most common complaint in the offices at chiropractor Durban. Low back and leg pain have the dubious pride of first place. If you have temporal, or facial pain make sure your chiropractor Durban also examines your jaw joints. If you are suffering from severe migraine type headaches and facial pain, be ready to tell your chiropractor if you get popping sounds and often pain just in front of the ear in one or both jaw joints. Do you clench your teeth at night? Dr Harpham, Graeme has relocated to the UK. Rib treatment is an essential ingredient of every one of those listed in chiropractor Durban. Rain pain is extremely common, partly because each rib has four joints; three with the spine and one articulating with the sternum. In its more extreme form it can cause a very disabling condition known as Tietze's syndrome which affects the breastbone. Right lower rib pain invites questions about the gall bladder and liver which lie just beneath. TIETZES SYNDROME Casefile - breast bone pain. Each rib - 24 of them - has three joints where they meet the spine, plus one where they articulate with the sternum. Nearly one hundred joints of potential rib pain. Think about Chiropractic rib pain treatment. But a correct diagnosis when it comes to chest pain, and heart attack symptoms and signs, is obviously crucial. One nasty little condition that responds well to chiropractic is Tietzes syndrome. It's often confused with a heart attack, causing breastbone pain. Over and above the more common causes of tingling in the arms and hands, usually due to degenerative joints of Luschka in the cervical spine after a poorly managed whiplash injury, the narrow inter scalene triangle at the base of the neck is not infrequently at the root of a deep ache in the upper extremity, as anatomists call it. Your chiropractor Durban is well qualified to treat this nasty condition; occasionally surgery is needed, but not unless you've left it too long. If you have radiating pain and tingling going down your arm from your neck, then there are two important questions that you should be able to answer when first consulting a chiropractor. It helps him or her make the correct diagnosis. An MRI scan would confirm it, but for the majority that's out of reach. An X ray is mandatory if there is numbness or weakness in the limb. Exactly which fingers are affected if the tingling goes into the hand? Is the ache in the lower arm relieved or aggravated by lifting your arm above your head as in hanging the washing? 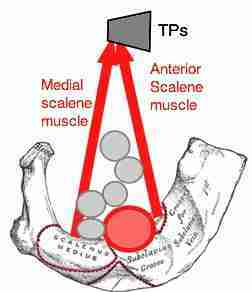 In the management of arm pain, the narrow passage between the scalene muscles and the first rib should always be considered. Any spasm of the muscles or fixation of the first rib may be the underlying cause of the deep ache in the limb. An important point in the diagnosis of carpal tunnel syndrome is that the tingling and ache never affects the little finger; the median nerve supplies the first four only. It's a so called double crush condition; in the wrist and elsewhere in the forearm, shoulder or neck. Lower back pain is probably the most common complaint treated in chiropractic clinics; it's a serious problem particularly if a nerve root is affected. If you have an aching leg, with associated tingling and weakness, don't expect the condition to be fixed in a couple of treatments. Miracles we do at once, but the impossible takes a little longer. The most commonly affected nerve causes sciatica; it supplies the back of the thigh, the calf and the foot. If you bend slowly forwards the affected leg will be much tighter than the other. A simple provocation of the pain is done using the Slump Test; you can do it yourself at home. Neglected, it causes a drop foot, or an inability to raise the great phalanx, or stand on the toes. In the older person, the Femoral nerve is more often affected; usually, but not always, bending backwards and to the side provokes the pain down the leg. The front of the thigh, and the inner lower limb aches and frequently tingles or is numb. The knee may give way when climbing stairs. Notice how this man has a twist in his spine; it's a temporary affair known as an antagia; once the herniated disc has been correctly treated using chiropractic adjustments, he will stand up straight again. It's a serious sign and often leads onto a painful sciatica; in my book, intermittent bed rest, exercises and chiropractic help is the solution. If you're an Medical Aid executive, then the words lower back and leg pain are likely to make you retch! And that's the reason they're seriously interested in Chiropractic. Because research after research confirms that Chiropractic does it better, and saves them bucketfuls of boodle. Even Edzard Ernst, a serious critic of Chiropractic, can't deny it. Whether it's L4 lumbar spine, or even L2 that is the cause of Meralgia Paresthetica medicine's own research shows we do it better than drugs and surgery. Actually there is no recognised medical treatment for Meralgia Paresthetica. Can you raise the big toe? Chronically subluxated lumbar facets (the lumbar facet syndrome ) is characterised by pain when bending backwards and to the side. If you allow them to remain chronically subluxated, starved of oxygen and nutrients they start to degenerate: lumbar facet arthropathy. MERALGIA PARESTHETICA ... pain or tingling on the front or side of the upper thigh. Find relief at Chiropractor Durban; there's a doctor in your neighbourhood. For those in the Waterfall area, you'll find help at Chiroplus. Durban is privileged to have a top class chiropractic institution at DUT. Thanks to the vision of the Chiropractic Association of South Africa and men and women like Dr Glynn Till and Dr Charmaign Korporaal, the institute was started despite great opposition some two decades ago. Without it, and the newer programme at JU there would today be no more than a handful of aging chiropractors in South Africa. APPLE DIET ...really does keeps the doctor away. CHICKEN BONES ... cure for your arthritis? 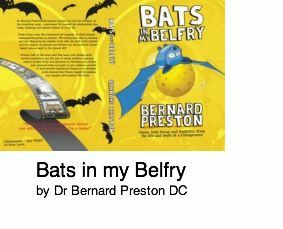 Go to BERNARD PRESTON home page … light and amusing anecdotes from the clinic. Available in the Americas and South Africa as a paperback, and worldwide for a fraction of the price ($2.99) instantly from Amazon as an ebook.